Home checkers - This will involve visiting potential families at their home address. talking with them, advising them on their choice of dog and explaining to them how German Shepherd Dog Rescue works and assessing their suitability for any available dogs. As you would expect this is really only for the experienced and we will need to assess the suitability of volunteers who offer to help with this. Dog Assessors - again must have a good knowledge of the breed and be prepared to go to people's homes to assess their dog for rehoming. Transport - Could you help by collecting a dog from its owner or delivering a dog to its new owners or fosterers? Anyone willing to do some driving is always welcome. Often, if there is some distance to take a dog, we work where possible in relays thereby cutting down the amount of driving any one of us has to do by each taking the dog just a part of the route. 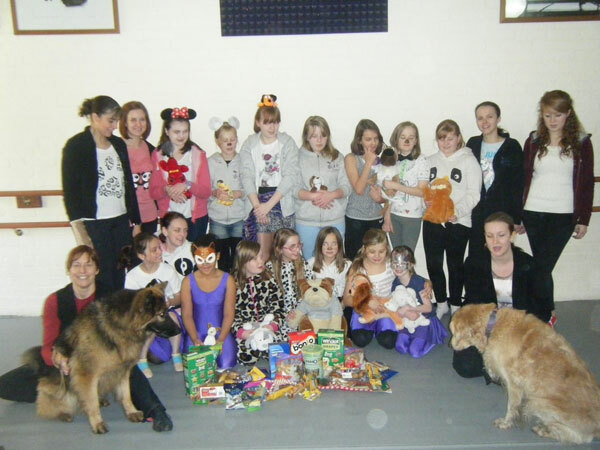 Dog and Area Coordinators - working together and responsible for running a region. To see through the whole process of assessment right through to adoption and follow up ensuring that our dogs go to the right homes. 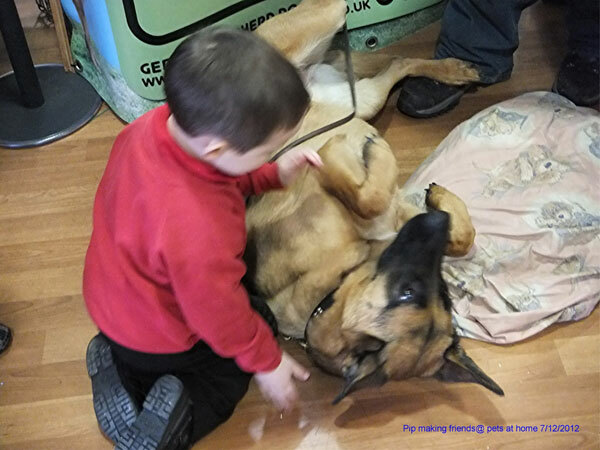 Fund Raising - As GSDR is run entirely by volunteers we rely on the generosity of our supporters to help us fund the work of the rescue. Our biggest expenditures are kenneling costs and veterinary treatment. The more money we raise, the more dogs we can help - it really is as simple as that. Come and join us, meet lots of new friends and have some fun helping this wonderful breed. GSDR needs you. Many of the dogs that come into our care have suffered abuse or neglect and often require expensive veterinary treatment. 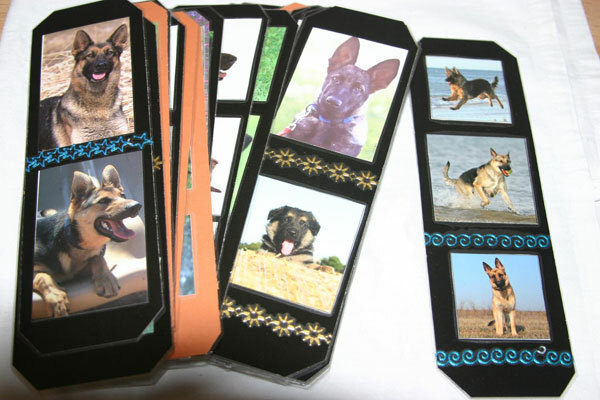 Some dogs may require long-term or lifelong treatment which GSDR need to have funding to pay for. 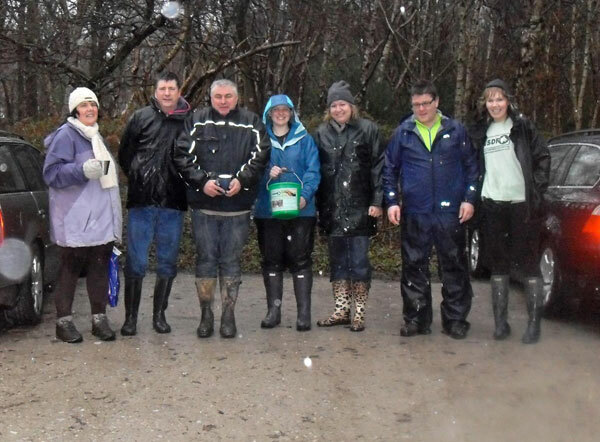 Being a voluntary organisation money has to be raised through donations and fundraising activities. At present, the donations we receive are barely enough to cover the running costs and additional funds will be required to develop our work further. 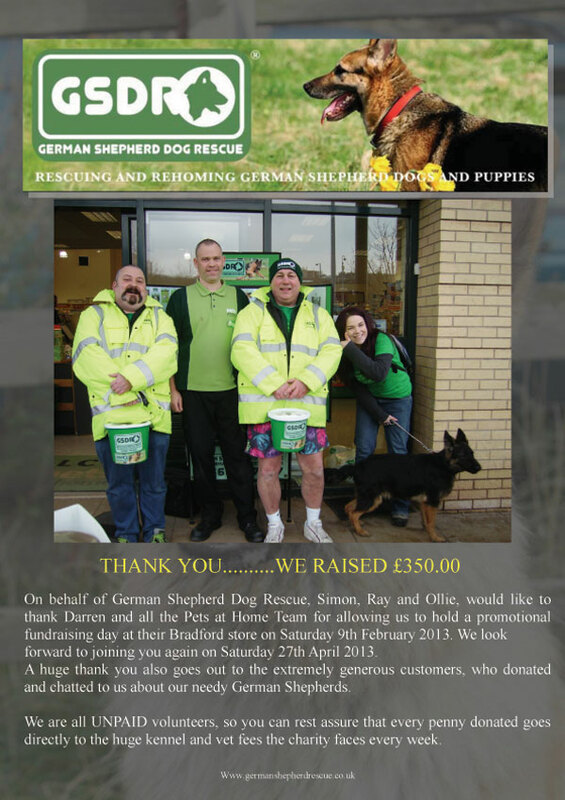 All monies raised are used to help rescue and re-home unwanted GSD. 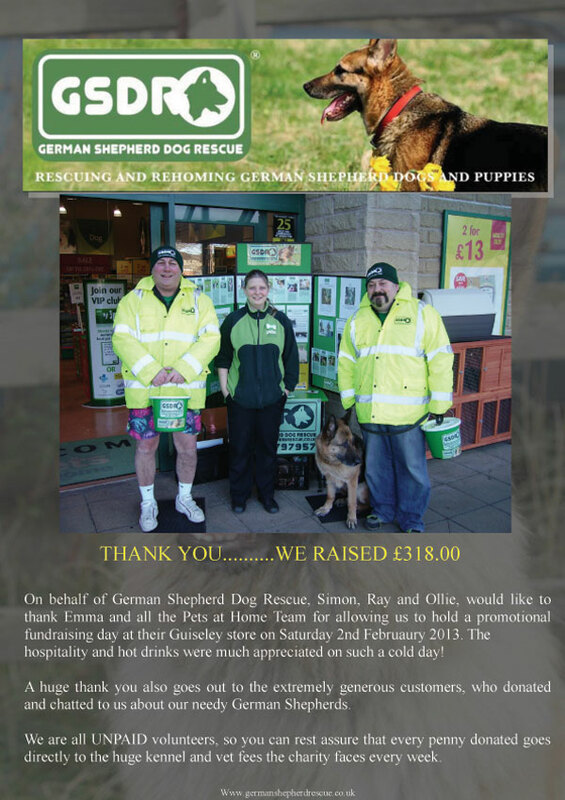 GSDR is a registered charity and volunteers are not paid, they help simply because they care. Ray and Si in the north east team have raised thousands of pounds for the rescue and are out most weekends and in all weathers. 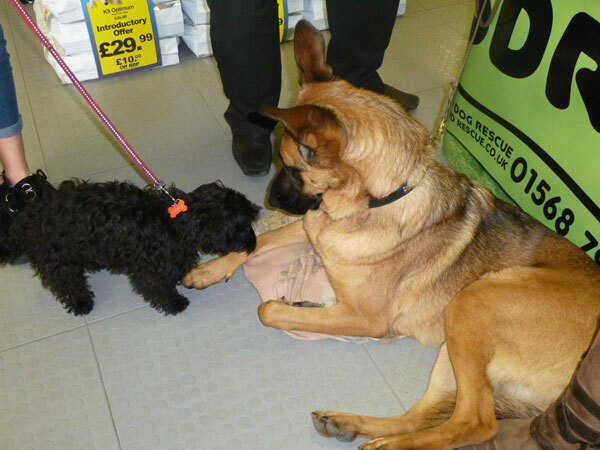 They are a well-known sight now around the big pet stores in the NE and the two of them have developed a wonderful friendship. Sadly the lovely Ollie is no longer with us as he died as a result of a tumour in February 2013. RIP Ollie, very much loved and very much missed. Two Fat Blokes fundraise most weekends - those shorts come out in all weathers! 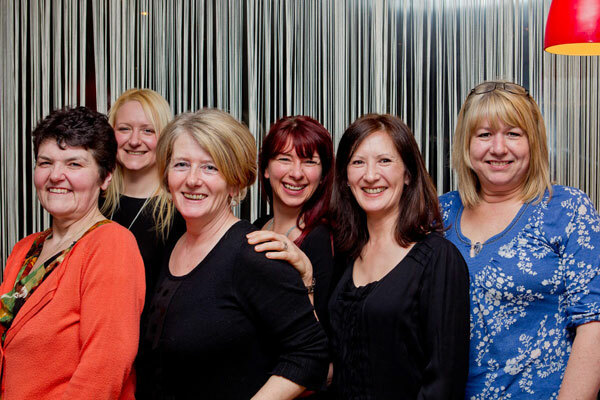 Not only are theses ladies in training for running the relay half marathon in Leeds on Sunday 12th May 2013, they are pictured here on a curry night fundraiser. Well at least with all that running, they can eat as much curry as they like! 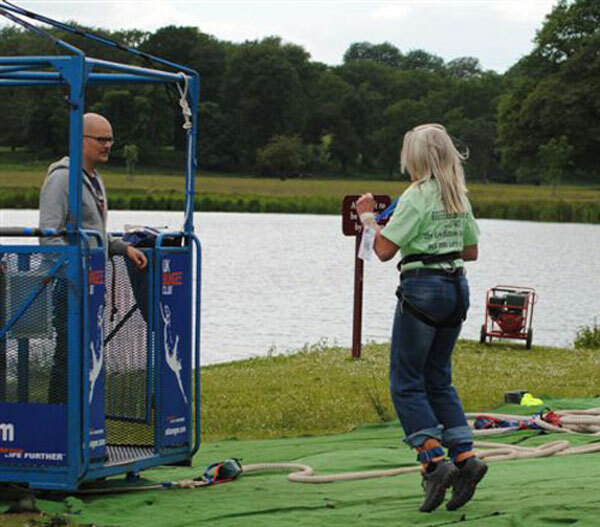 You can leap off a crane on the end of an elastic band to raise money for GSDR! 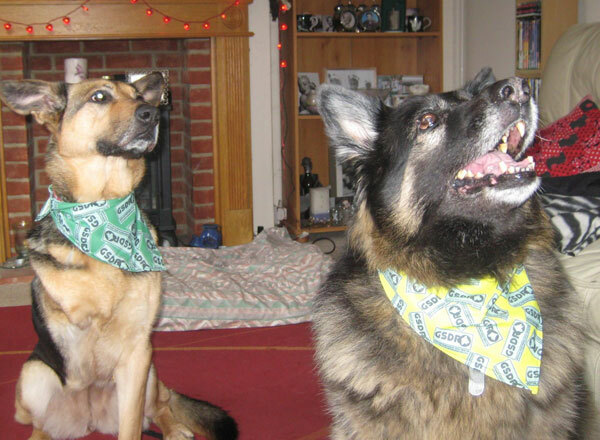 Join one of our GSDR walks - helping raise funds for the rescue no matter what the weather! Handcrafted personalised bling made by our talented volunteers. Perhaps you have owned a German Shepherd before and really care about the welfare of the breed, maybe your own dog has died or you cannot commit yourself to giving a dog a permanent home, but would still like to help us in some way. If so have you considered short term fostering? Fosterers are very much needed to care for dogs in a homely environment while their new homes and prospective owners are home checked. During this time the dog can be assessed and relevant information can be used to help decide on the most suitable placement. This information can also be passed on to their new owners to help them adjust and prepare for their new dog. Fostering can be very satisfying as your experience, insight and input are important in finding the best home and family for the right dog. In all aspects of our work which deal directly with dogs and their owners, some experience with GSDs is necessary although much can be learned while actually helping out. Volunteers are assessed to ensure suitability and to help the new volunteer to join in at an appropriate level of skill. Please help us by making a donation so that we can help re home more unwanted German Shepherd Dogs. 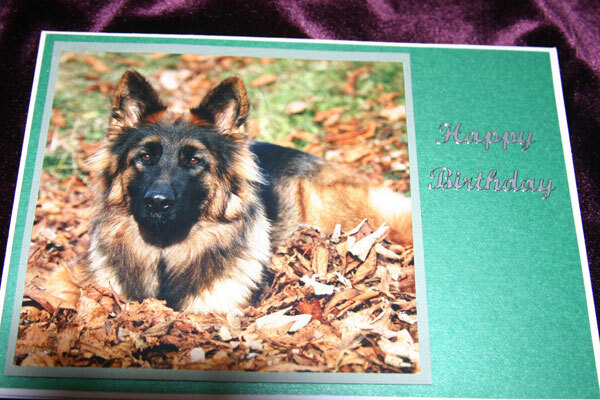 Donations can be sent to Jayne Shenstone, German Shepherd Rescue Little Vauld, Marden Hereford HR1 3HA. 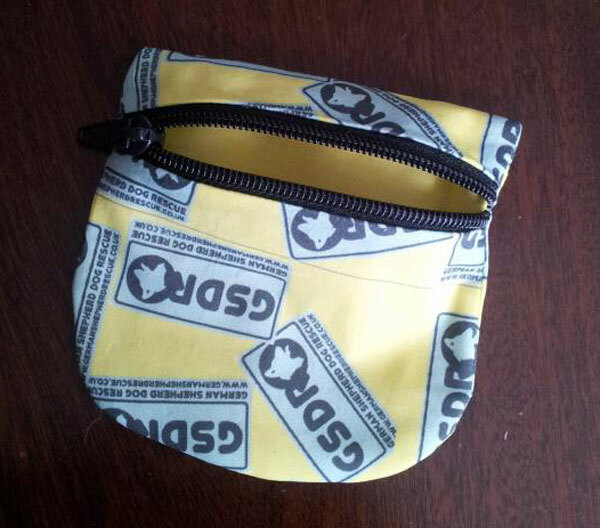 We also accept Paypal payments - just click on the Paypal button below. Thankyou.